A good friend of mine says when asked how he likes a particular varietal, “it goes well with the cheese.” It has become a joke between us, but he is actually correct; wine does go very well with cheese. The creamy richness and pungent flavors of cheese matches deliciously with wine, cutting through the wine’s acidity: cheese complements the fruity flavors found in wine. There are some basics to take into consideration when matching wine with cheese. A mild creamy cheese will pair better with a lighter white wine; while a pungent ripe cheese will marry happily with a bold red. This column will outline some basics for finding the perfect pair for your next wine and cheese tasting. A few good general tips to keep in mind: soft, creamy cheeses will coat your palate when you eat them. To cut through this creamy coating, pair refreshing, slightly acidic whites to creamy cheeses to ensure that you are getting the best flavors out of your wine. Very ripe, pungent cheeses can be overpowering if not paired with a bold red. Match strong cheese to big, fruit-forward, powerful reds with lots of flavor. A light white wine like a Pinot Gris, Sauvignon Blanc, Riesling or a Viognier will stand up well to goat cheese, Boursin with herbs or triple cream cheese, like Saint Andre. The wine characteristics in these examples are crisp, metallic, often acidic with floral, citrus, herbaceous and tropical fruit flavors, while the cheeses are creamy, slightly tart and rich. They are milder than some cheese selections available, but they still have distinct character. Baked Brie can be a wonderful complement to any sparkling wine or Chardonnay. Swiss and Jarlsberg also go well with Chardonnay, as the tangy acidity of the cheese will cut through the oaky qualities of the wine. 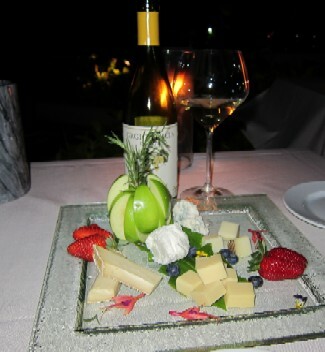 If you are thinking of holding a fondue party with melted Gruyere cheese, pair it with Pinot Grigio. The honeysuckle and tropical fruit flavors of the Pinot Grigio will enhance the pungent salty flavor and creamy texture of the Gruyere, without overpowering the palate. Lighter reds, such as Sangiovese, Barberesco or Pinot Noir pair wonderfully with some specialty cheeses like Italian Sottocenere studded with black truffles, Havarti with Dill, or even a simple farmer’s cheese. As mentioned before, the heavier the red, the heartier your cheese can be. Red Zinfandel matches beautifully with Buffalo Mozzarella, as the creamy cheese will mellow out the spicy wine. Red Zins are also lovely matches with aged Provolone, with its supple flavors complementing the fruit forward characteristics of the Zinfandel. A Merlot becomes playful when matched with Romano. The sharp pungent cheese flavors enhance the berry, plum and currant flavors of the wine. Syrah or Shiraz goes exceptionally well with aged cheddar. I know you are thinking cheddar is a bit unexciting, but when matched with a spicy wine, the flavors explode. Cabernet Sauvignon generally requires a bold cheese like English Cheddar or aged Gouda. Try melting these to sauce a roast or pasta dish, as the cheese will help mellow the tannins in the wine, but will not disturb the distinct character of the Cab. the world with deliberate attention given to what will grow best in specific regions, cheese makers give the same focus to their craft. Don’t be afraid to be adventurous, even if you’re not sure you’ve made the correct pairing, go ahead and experiment. I never have been a fan of Blue Cheese or Roquefort, much to the horror of my Roquefort loving family that will slather it on anything. I went to a dinner with local chef, Jonathan Calabrese, where he matched a Vintage Port to Blue Cheese and pears at the end of our meal. I was hooked. The sweet pears, the thick Port and the tangy Blue Cheese complemented each other flawlessly. I knew I always loved Parmesan, and have enjoyed many great Amarone wines, but matching them together opens the palate to a whole new experience. The dried fruit characteristics of the Amarone paired with the salty, velvety Parmesan created a superb combination.